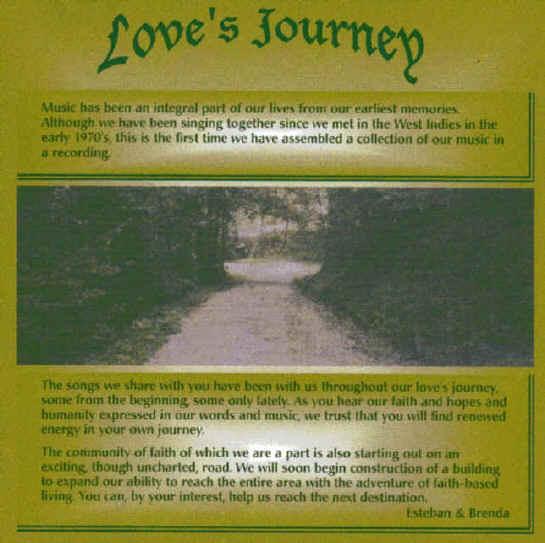 In the spring of 2001 Love's Journey released a CD entitled "faith building." This music album is a collection of favourite songs that Esteban and Brenda shared over the years with their church family and community gatherings. Limited copies may still be ordered, or purchased at live public performances. Their thoughts on inspirational music are shared in this CD insert. To preview the album song list (and link to music site), click "listen."